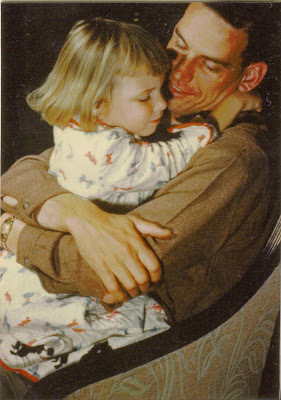 This was taken of Dad and me the night before he left to fight in Korea. The label says it was in August, 1951. It looks like a Norman Rockwell! I agree; it does look like a Norman Rockwell. What a beautiful memory. Fr. Gregory took the words write out of my mouth. That is a wonderful, wonderful picture - especially the title you gave it. I am highly impressed by that photo. It DOES look like a Rockwell. Was it originally on Kodachrome? It looks like a Kodachrome. I thought it looked like a Rockwell too. Such a beautiful memory for sure. Reminds me of when my dad went to Bosnia - the first time he had ever been deployed any where (certainly not the last). Aww, I love that picture!